Although we’re in the middle of our rainy season, the summer will soon be here which means hot weather and dry conditions. Drought tolerant plants are a biggie in water wise gardening, but so is mulching, watering, and the soil you use along with many other factors. By implementing just a few of these changes (or all of them if you’re really gung ho), you’ll greatly reduce your water usage while still keeping your garden beautiful and productive all year round. Drought tolerant plants are those that, once established, can go longer periods of time between watering’s. These plants can be especially helpful if you don’t have irrigation or if you have a larger garden with a lot of plants. If you’re thinking of adding some of these drought tolerant plants to your garden, just remember that for the first 3-4 years they will need regular watering so that they can establish a deep and healthy root system. 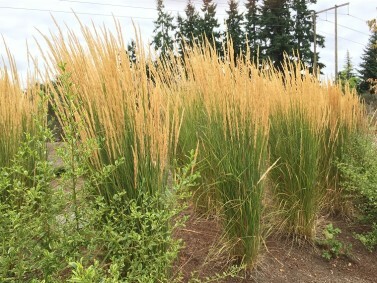 Karl Foerster Feather Reed Grass (Calamagrostis acutiflora ‘Karl Foerster’)- This drought tolerant, deciduous grass does best in full sun and well-drained soil where it gets to be 2-3 feet tall and 2 feet wide. When the flower tufts appear, it becomes about 6 feet tall. These plumes emerge as rosy pink before changing to maroon, then to bronze, and finally they become a rich golden color which lasts through winter. 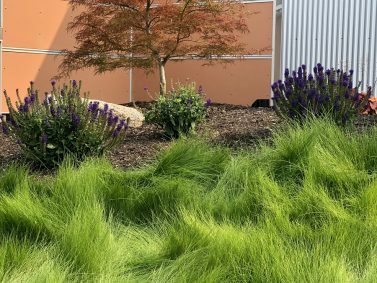 Karl Foerster grass is upright in shape and adds visual structure to gardens, whether in mass plantings as a seasonal screen, or intermingled with perennials. Kaleidoscope Abelia (Abelia x grandiflora ‘Kaleidoscope’)- This evergreen shrub gets to be about 3 feet tall and 3 feet wide and feels at home in rich, organic soil but will tolerate clay or sandy soil as long as there is adequate drainage. 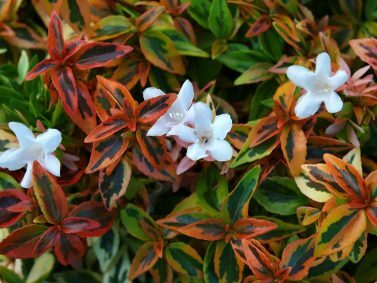 Abelia’s relatively small size combined with its dynamic color transformation through the year make it a great choice for small gardens where every square inch counts! In early spring, tiny light-green leaves appear with bright yellow edges, maturing to have dark green centers and lime green edges. White flowers bloom in summer through fall which provide food for bees and butterflies. The growing season is finished beautifully as fall colors of red, orange, and yellow wash over this shrub. We suggest planting Abelia in full sun to get the best color transformation, but it will do fine in light shade also. 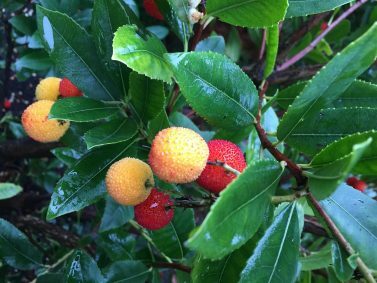 Dwarf Strawberry Tree (Arbutus unedo ‘Compacta’)- Useful as both an evergreen shrub or small multi-stem tree, the Dwarf Strawberry Tree is an attractive 4 season plant. Foliage is dark, glossy green throughout the year and is complimented by white/pink flowers in October-December along with orange-red edible fruits. The bark is also an attractive cinnamon color. It prefers well-drained soil and partial to full sun but should be placed in a more protected spot to help with fruiting. It will get to be about 6 feet tall and wide. You can read more about these and other drought tolerant plants here and here. Before you go to a nursery and before you start planting, it’s important to observe the light, wind, and soil conditions throughout your gardens. Planting something like a Hosta in full sun or a Sunrose in full shade isn’t going to do you or the plants any favors. You want to choose the right plant for the right space. It’s also a good idea to do some research and look at the tags on plants for their water needs. 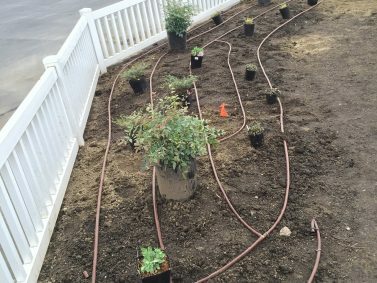 This way you can start to group plants by their water needs so that if you do have more demanding plants, you won’t place those out in the middle of nowhere where no hoses or irrigation can reach. Planning out your garden will save time, energy, money, and of course, water. 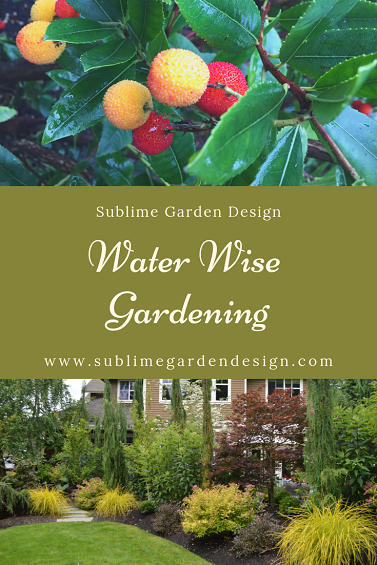 Selecting the right plants for your water wise garden will take you far in lowering your water usage, but having a healthy, rich soil is also equally important. Not all soils are created equal. If you have soil that’s too sandy, you’ll end up with a very quick draining soil and on the other end of the spectrum if you have soil that has too much clay, water will drain slowly and possibly start pooling on the surface. Both soil situations can be remedied by adding an amendment of organic matter which will improve the texture, water holding capacity, and nutrient levels. Amendments that you can add to your soil include composts and composted manures, mulched leaves, and even peat moss and mixing it in to your existing soil about 6-10 inches deep. Adding organic matter will help your soils retain moisture longer and help fix drainage issues. Healthy soil can have as many as 4 billion organisms in one teaspoon of soil. This huge diversity of organisms works together to help keep the weeds and insects that are harmful to your plants in check while at the same time producing vital nutrients. The depth of your healthy soil will also play a big factor in its water holding capacity. The deeper the soil before hitting hard pan the less issues you will have. You can read more about the importance of healthy soil in your garden here and how to cultivate healthy soil in your landscape here. By adding a 2-3” layer of organic mulch over your planting beds at least one a year, you’ll help block weeds and help the soil retain moisture and raise the humidity level around your plants. Mulching can cut your water needs almost in half, reduces evaporation, prevents erosion, provides insulation and temperature control, and acts as a slow release source of nutrients for the plants by feeding the microorganisms in the soil. The best time to mulch is late winter or early spring and fall. Avoid applying mulch when the soil is very dry in the summer. You can use a compost mulch or arborist chips as a mulch layer in your garden. If you have a lot of area to cover with mulch, consider getting it blown in to save time or if you have the tools, you can use Chip Drop to a get a large, free pile of wood chips delivered to you. 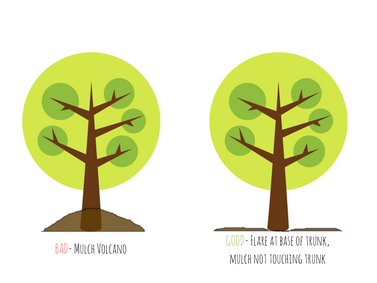 You also want to make sure you’re not mounding the mulch in a volcano around trees and shrubs. I have a love/hate relationship with lawn. I strongly dislike all the mowing and watering, but my dog loves rolling around in it and it’s pretty great for picnics. Our HOA also seems to think it’s the greatest thing since sliced bread. The typical lawn can become one of the more labor-intensive pieces of the garden. Reducing the amount of lawn you have and replacing it with low maintenance and/or drought tolerant plants will greatly reduce your garden’s water consumption. If you want the look of lawn but not the maintenance that comes with it, you can also choose a lawn alternative that won’t require nearly as much water and there’s even some that don’t require any mowing. Whether you have a garden full of drought tolerant plants or just a handful, at some point you’ll need to water, especially if your garden is brand new. An irrigation system with a timer and rain sensor will definitely be helpful if you don’t feel like dragging around hoses all summer. Drip irrigation and soaker hoses are much more efficient than just spray rotors. They deliver water right to the root zone, reduces evaporation, and keeps the soil between plants drier which will also help control weeds. Since we get so much rain in our area, especially right now, why not use that to your advantage? You can use rain barrels or cisterns to collect rain water and then use it to water your plants, for free. 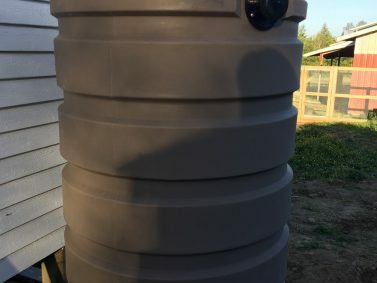 You can read more about making your own rain barrel here and it’s worth talking to your city or county to see what kinds of programs or rewards they might have for harvesting rain on your property. By collecting rain water, you’ll also help reduce storm water runoff into streams and nearby water bodies. Have you made adjustments in your garden to help reduce your water usage? What has worked or not worked? 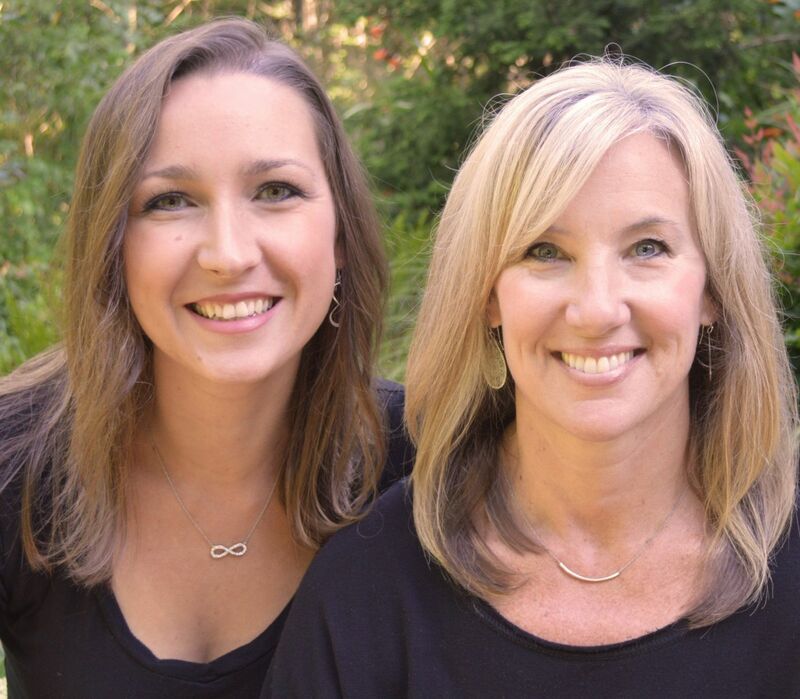 Let us know in the comments we’d love to hear from you! Organized under Education, Garden Maintenance, Garden Tips & Advice, Gardens, Low Maintenance Gardens, Sustainability, Water-wise Gardening. Labeled as drip irrigation, drought tolerant landscapes, drought tolerant plants, how not to mulch, how to mulch, how to plan a garden, how to water wise gardening, important of soil, lawn alternatives, low maintenance gardens, low maintenance plants, mulching, planting plants, rain barrel, reduce water usage, right plants for the right space, soaker hose, water wise gardening, water wise landscapes.